Editors: Kaltschmitt, M., Themelis, N.J. and Bronicki, L.Y., et.al. 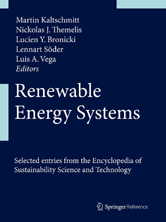 Renewable Energy Systems provides an authoritative introduction to a wide variety of renewable energy sources. State-of-the-art coverage includes geothermal power stations, ocean energy, renewable energy from biomass, waste to energy, and wind power.